Do you work for PlanGrid? Learning about PlanGrid? We can help. "plangrid is ideal for managing construction plans"
We like that we can use plangrid to work offline, or that we can create reports of construction incidents. It is excellent to check lists of quality control checks, and to manage checklists thanks to its very useful drag and drop system. We like to be able to add photos or drawings to construction reports. Plangrid does not have an integrated CRM tool that allows us to properly review and organize our clients. We do not like not being able to follow budgets and costs of each job, or not being able to track each team. Now, plangrid has a very slow RFI system. We do not like the prices of their plans, since they seem expensive (especially the crane plan). We recommend using plangrid to manage subcontractors easily thanks to its omnichannel system. It is highly recommended to work with hyperlinks, or to superimpose planes in the middle of work. Plangrid is excellent, and we are satisfied with its use. Thanks to plangrid we feel much more confident, because it makes us notice the increase of our productivity at work, helping us to fulfill the daily tasks of our construction work in a few time margins. It has also been made easier for us to work with hyperlinks, since plangrid exposes this function in a very simple way, allowing us to convert each detail call and plan automatically into a hyperlink. "Plangrid: the solution for our construction projects "
It is our total pleasure that it is so easy to create hyperlinks. These are created automatically when converting index planes. Allows the use of photos, plans and lists of incidents. We would have liked to revise your plans better, since we acquired the Dozer plan and want to upgrade to Crane. Allows synchronization between several users. It is difficult to superimpose planes when you have to compare them. Although the fact of updating the planes in all the equipment is useful, this process is a bit slow (The speed depends on the internet signal of each device, so it is complicated to implement if you are in rural areas or with little signal). We recommend the use of Plangrid when it comes to large construction equipment that requires good organization. We can always be on the lookout for everything related to RIF and shipments. It gives us the tools to always be in contact with our subcontractors is one of the best software for the execution of construction projects and we highly recommend it. One of the main problems we had before the implementation of this software is the creation of incident reports in a correct way, without any error. With Plangrid that problem is a thing of the past we are satisfied. Another solution that we find with its implementation is everything related to the management of subcontractors, this platform allows us to do that job in a very good way. 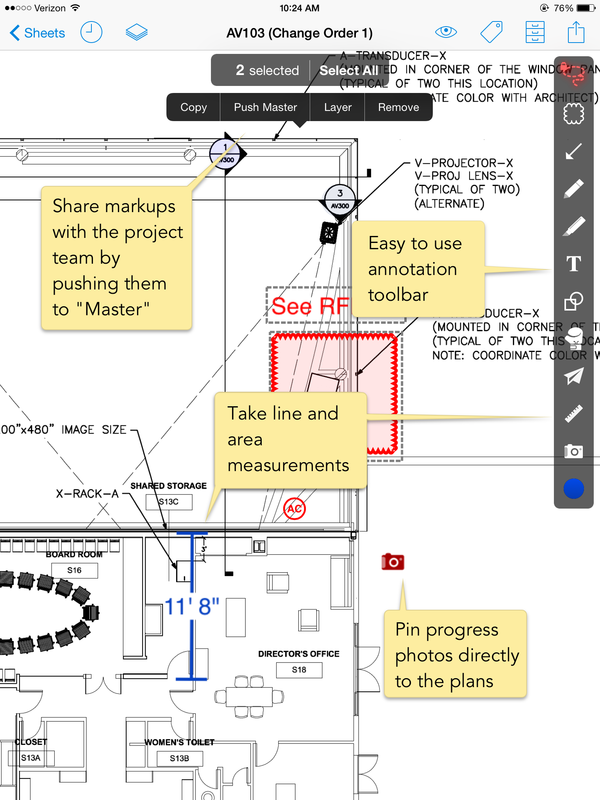 "Plangrid: an effective tool for construction professionals"
This software is ideal for adding observations and quick comments on a specific area in the project: it allows you to add colors, arrows, and more figures. It allows offline work and its incident lists are very complete. The modifications of the plans are updated in real time on each synchronized device. It gives us the function to compare one plane with another and see which is better. Contract management does not allow a major flaw for this platform. Our team is not satisfied with the results obtained in terms of monitoring budgets and labor costs offered. The quality control checklist n has certain flaws. In our team of professionals we recommend Plangrid because it is very easy to access the RFI photos of each project at all times, which saves time. We can access from our phones. It is recommended to all those who have problems with the creation of incident reports since Plangrid allows them to do it in a very short time, and also saves a lot with the excellent prices of their plans. With this platform we have found the solution to our problems with the quality control checklists, leaving our clients more satisfied with the results obtained. It is ideal to manage the tasks of our work to others that is also excellent for document management turning it into a very complete software allows us to make reports with photos thus improving the process. "Plangrid is ideal for handling all types of construction plans"
This excellent manager of construction works allows us to make lists of incidents during the construction process, and allows us to manage RFI and photos on top of the files, so that it is easier to guide the team and organize the work. It is quite comfortable, because it allows us to enter the project data at any time we want, and is focused on improving teamwork. There are not many things that bother us to plan, but one of them would be the one that is so complicated when it comes to superimposing construction plans, with which there are conflicts due to its antiquated drag and drop tool. We can not keep an adequate control of the versions of each plane, since it is complicated to enter the project's change history (the mechanics to do this are confusing). It is excellent to use it from any device, and that allows us to work without internet connection, so we recommend it a lot for work in areas of low population, or mountainous areas where there is little telephone signal. We recommend it to have a good control of the life cycle of the construction, and to be properly synchronized with the work team. There are not many problems that we have solved with plangrid that we have had before, but it has undoubtedly benefited us a lot by allowing us to work comfortably in non-urban areas, where we can still work being well synchronized at all times. "Plangrid is perfect for planning construction work"
What we like most about using plan is that it allows us to work offline, which is essential for those jobs that must be carried out in rural areas where there is difficult access to the internet because of the little telephone signal. We like that is easy to manage buildings of commercial buildings, and that their mobile access is easy and quick to use. We love the grid of controls, which makes it easier to manipulate documents. In general, the administration of PlanGrid is incredible. We do not like that it does not allow us to make estimates of construction costs, which makes budgeting a bit more difficult, or at least the monitoring of these. It fails to remove a lot when not allowing us to make reports with photos, and its drag and drop tool is outdated, and sometimes it makes it difficult to use (mainly when you are working with several construction plans at the same time). We add that they charge for each individual project and everything returns to be much more expensive than the plan that we bought at the beginning. Plangrid offers a large number of sheets to work with (5000 in the Dozer plan). This plan costs only $ 59 per month, which is an excellent price. Plangrid is highly recommended for the creation of hyperlinks, which are useful when you want to access information more comfortably. As far as the quality control checklists are concerned, these are quite easy to customize, so we had great difficulties in the past. It has benefited us a lot by allowing us to make comments and add notes in different parts of the construction. Another great benefit provided by plangrid is that it allows you to manage projects in a completely unlimited way. "Plangrid is very useful to manage our plans"
Plangrid fascinates us by the simple thing that to manage subcontractors, and orders of change of construction. It offers a good deployment on mobile devices, and works pretty well for checklists, because it allows you to manage documents, tasks, and your drag and drop tool is excellent. The prices offered by plangrid seem excellent. For example, the Crane plan costs only $ 119 per month, and offers capacity for almost unlimited photos, projects and documents. Plangrid does not allow us to directly manage the budgets and costs of each job, nor manage contracts. It does not offer a CRM tool, with which it would be easier to organize our customers. Their integration of drawings is limited, as are their quality control checklists. As far as version control is concerned, this is not automated enough. We recommend using plangrid for the management of plans, because it allows you to add images and notes to them, as well as to compare them with others in detail. It is also highly recommended because you can access it without an internet connection. We highly recommend the use of plangrid also for the use of hyperlinks, it is quite comfortable. We have noticed great benefits in terms of the quality of our construction incident reports, which are quite customizable. Its drag-and-drop tool saves us time, and its construction management for buildings makes us more comfortable with plangrid than with other platforms. "Plangrid is a practical and innovative service"
"with Plangrid any construction team will be properly organized"
"With Plangrid it is surprisingly easy to organize our projects"
"Plangrid is essential for the correct organization of our contractor team"
"With Plangrid it is much easier to work as a team"
We recommend without any doubt the acquisition of the crane plan. It costs only $ 119 per month and offers completely unlimited use features (projects, photos, documents and even the use of unlimited sheets). 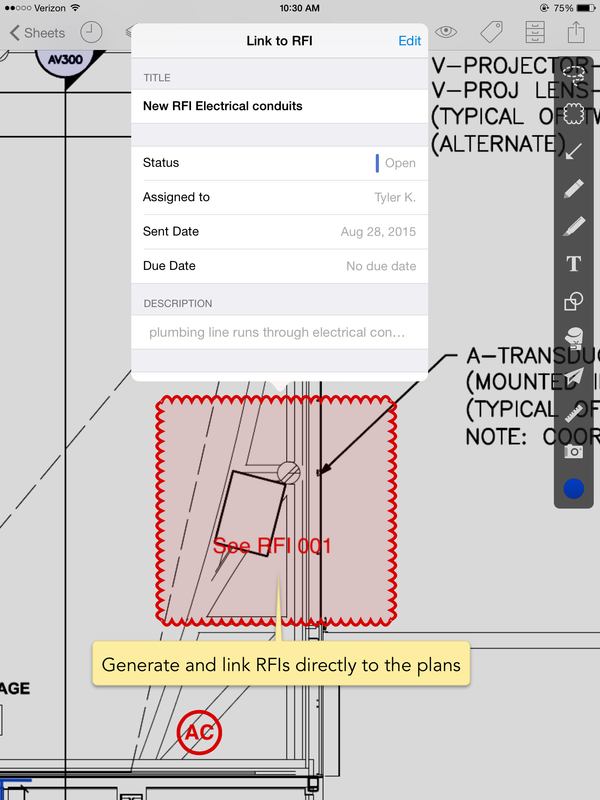 PlanGrid has enabled our project to post RFIs, overlay old drawing sets, and transmit documents. The software is easy to use, and allows many users to continuously update a set of plans. The calibration/measurement tools work well, tagging documents is also pretty easy to do. This makes viewing linked RFIs easier than say in another software like bluebeam. PlanGrid can sometimes take a long time to sync, and sometimes I think it doesn't fully sync at all, so it seems that every time you log in it tells you that you are looking at an "outdated sheet". It would be better if it recorded the last time that the document was updated, so that you don't worry that you are looking at severely outdated documents. "PlanGrid is the best software to integrate plans and projects"
One of my favorite programs of distribution of plans. Fast and east to update the drawings. Also, good features to add photos and comments for you and other team members. The cost is too high. Plangrid started very affordable, but in the last year it has increased its subscription prices by staggering percentages. Despite its high price we recommend this product for other customers to acquire it, it has many basic tools but you can achieve all the objectives that we hope to obtain by using it, PlanGrid fulfills all the necessary functions. Currently it seems to lack direct interaction or integration with other products with which it combines well. It is not a problem in any way, but a bit of additional integration can result in greater time savings, particularly at the production stage. "Great Software, Room for Improvement"
No longer having to carry around stacks of paperwork with floor plans, BOM, typicals, etc. Plan Grid has been a huge lifesaver. Plan Grid is both web and app based which allows me to choose the program that best suits my needs at the time I want to use it. Customer service is also very helpful. They have a chat function on the website which helps get you quick answers and they always take suggestions on future improvements. Some of the recent app upgrades minimize the way you can maneuver around the program. Its a big change from the previous versions and not as user friendly. Their new Daily Reports feature could be a great add but its complicated now and has not been helpful as of yet. All users start with a free trial. This will suffice for most people but you will ultimately need to pay to upgrade some of your employees for sure. Their training is expensive but if you take advantage of it, you will learn a lot of tips/tricks from their certified trainers. Also, my best advice is to mess around with the program as long as you have it because you will definitely learn a lot that way. I work for a commercial furniture dealership as a Project Manager and use Plan Grid in the field to store all my drawings and other relevant paperwork. Its all cloud based so as long as I have uploaded the docs in advance I have no worries about needing an internet connection while at a construction site. It also allows me to share the information with other team members and this has been incredibly beneficial. "PlanGrid is an all in one Construction solution that can streamline document management on your job"
PlanGrid has a simple interface that can easily be navigated by subcontractors, field staff, owners, or other users that may only need to use the software for one purpose (viewing drawings, submittals, RFIs, etc.). For Power Users, there are tons of tools and options to markup, sort or distribute information to all the major stakeholders on your project. No ability to make a template for new projects, you need to create a project and tweak all of the settings to your liking and then duplicate that project if you want to have anything representing a template. There are some helpful startup videos on their website to learn the ropes, I'd suggest viewing the first couple of videos before using the program. Document management is always a challenge on large construction projects and PlanGrid does a great job at consolidating and streamlining the document collection and distribution process. Plangrid makes getting plans, updates, punch items, photos, documents and all related work easy to get from the office to the job site and vice versa. Importing plans into Plangrid is easy and effortless and with the beta auto locating sheet number and name makes getting all correct information to the field effortless. Can be used from PC, Mac, Online Internet Browser, Android, Apple and many other services. So far there is not much we dislike about this program. Could make the user experience when taking photos and attaching them a bit more user friendly but other than that no complaints here. Definitely try to make sure to always update projects for field crews. It only takes a few minutes to upload new document versions to the program. 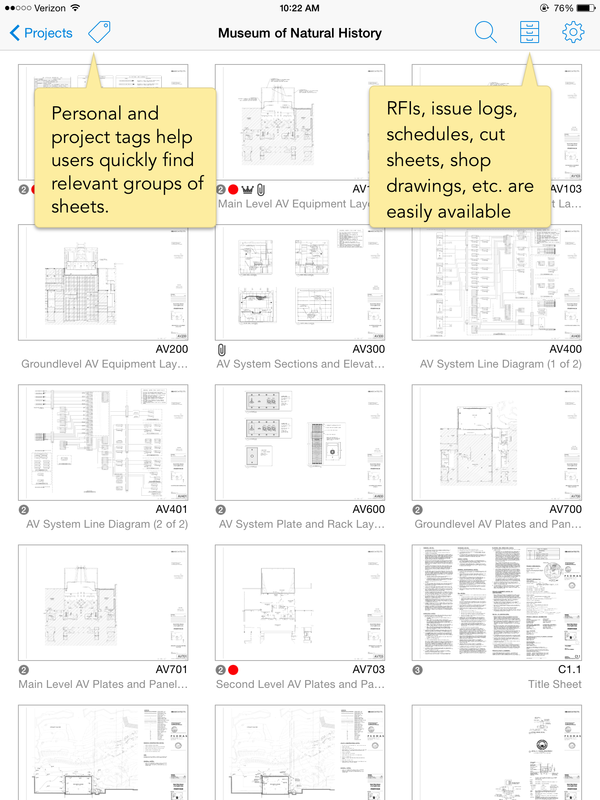 I also recommend having tablets to view in the field plans but it is not necessary. We are solving the constant struggle to keep up to date plans in our field workers hands and also provide them ways to send questions back to the office about certains areas and the ability to take photos of these problems may they occur. We can also mark the plans up with punch items and the field can see these punch items and mark them each complete. The app on the ipad is easy to use and using the desktop for setup is easy to navigate as well. You can't just share the link for viewing unless the other party has a subscribed/paid account with plangrid and not everyone has it. Also, I did have an issue with the program recognizing the plan sheets since the Architect/Engineer using a naming convention that was fairly long. My Team and myself will have to manually check each sheet everytime to make sure it capture the right sheet name or else it would not record and keep track of the drawings properly. For example, the sheet will have a hyphen at the end that it won't recognize and sometimes it will. So, it will keep a record of that sheet as if it were two different sets of drawings. I was hoping it would recognize it better so less manual work for myself and my Team. PlanGrid is great out in the field and not just for office use. Keeping construction plans in order and ease of coordinating work in the field. My Superintendents love it as well. "Easy to use planner with great accessability"
It is very accessible and it didn`t take so long to learn how to use the platform. Also it is mobile friendly that helps the planning a lot and access the information quickly. The user interface is also friendly and has a clear structure. Well, it isn`t as complex as I thought, for me it`s great but some others may want to look around on the market to see which platform surely meets their requirements. Personally, I like it but check all the features before purchasing it and setting up your account, it is not so complex. "Great for doing punch and correction notices"
We currently use both Procore and Plangrid to manage our drawings for a 400 unit apt. project and the superintendents prefer to use PlanGrid over Procore for the punch and for correction notices for its ease of use for marking up the plans with the necessary correction notations and for sending those out to the subcontractors. 1. Cost - it requires a subscription of several hundred dollars for access and except for a couple of our large subcontractors who use it at other sites none of the other subs are willing to buy a subscription so access is extremely limited. Fortunately correction notices can go out to all subs even if they don't have a subscription. 2. iPad and tablet memory use - unlike Procore which is cloud based PlanGrid downloads the plans to your iPad so it requires an iPad with quite a bit of memory and if there isn't enough memory then the program locks you out so you can't access it at all instead of giving you access to the plan sheets that have been downloaded already so you've paid your subscription fee but you can't access the program. Ditto if you go over your subscription plan which is based on the number of plan sheets, if you go over your subscription by one sheet you're completely locked out of the program and can't access the sheets you have paid for until you upgrade your subscription. Both are extremely annoying, be sure to buy an iPad with the largest memory available or you may have an expensive tablet you can't use unless you only work on small projects. Speed: It takes a long time to download sheets to the tablet, the superintendents usually do it overnight because even tho' its only updating with the latest sheets it takes hours. The biggest benefit are the correction notices and punch list ease. "Very easy to use, but a little pricey if you are in a small company"
I like how you can assign task to specific people in your company, ability to make mark ups on drawings, report submission is a nice feature too. It is very much mobile friendly and is great for those that use tablets in the field. I was a little frustrated uploading my own templates to reports because it only accepts pdf formats. I also thing for how developed the mobile and tabloid versions are they should allow to sink with your current cloud providers to merge plans, documents, pictures and etc. planning, scheduling, task distribution, report submission and tracking. I think it is a nice way to keep all of your documents and track progress in one place. "Use PlanGrid to make your construction team faster!" I would reocmmend rolling out PlanGrid in waves to different project teams, we were able to better control the integration and provide adequate training. Over the past year, my company integrated PlanGrid into our construction process, and used it to build several ground-up and renovation projects. I can safely say that PlanGrid has streamlined the construction process. It has greatly increased the collaboration of our field and office staff. We have also been able to reduce our paper use by utilization of the attachments features. We have found a variety of uses for the issues reporting module, which have enabled us to communicate more effectively with owners, architects, and subcontractors. If you want to become more organized and focused in your project delivery, then you should use PlanGrid. "Its greatest strength is also its weakness..."
PlanGrid is a very accessible, easy to use platform which allows users to quickly and easily jump into the latest set of plans, create and distribute punch lists, and push drawing revisions out in real time. PlanGrid's simplicity is also its greatest weakness. It struggles to be anything but a document storage platform, and there are companies out there who are doing very similar things on much more complex and dynamic platforms. RFIs and Submittals are clunky and not intuitive. The pricing structure is also limiting. Costs that never cease are a big barrier to entry for many of our subs. It is a great but limited tool - make sure the cost is something that everyone can get their arms around. Drawing management is the biggest issue that PlanGrid resolves, IF you can get buy in from subcontractors at the beginning of a project. Many field issues are avoided if everyone has the most current set of plans in their hands at all times. "Best in class mobile document management"
My typical sales pitch to my subcontractors is to consider it a replacement for their typical "reproduction" costs on a project. Instead of printing up the entire construction set 2-4 times over the life of the project, they just put that cost into PlanGrid. It's a pretty easy sell that way. For my document control engineers, it's ENORMOUSLY easier than posting with red pencil on a paper set, and all of the postings are slip-sheeted onto th newest drawings with no effort at all! The punchlist feature is very easy to use, and easy to publish to contractors. Depending on the subscription you have with plan grid, you could keep the entire projects revision sheets on your account. This helps when doing the punchlist, because you can see exactly when something was revised during the project. You can upload multiple attachments in plan grid, that don't count in your sheet limit. This only includes .pdfs, but you can upload as many submittals, spec sheets, schedules, etc. as you need. They do however take up space on your ipad, as everything does as well, so if you have a full device you need to be conscious about that. We use the attachments feature to review our millwork shop drawings with our clients during on site meeting with our national clients. No need to print out the sheets and flip through them. There is no separation between issues on a project during the project and creating a punchlist at the end. Would like to see two different features there. I would like to see the same editing features ( box, text, etc.) from the page review in the attachment review. It is free to try, so just give it a try. There are many programs that are similar, and they each have there pros and cons. Any construction issues during the construction administration phase of the project. Less printing for construction meetings and less wasted printing for submittal reviews. "Working smart, not hard. " The system has great functionality. The construction industry is becoming more streamline because of applications like these. Plangrid is by far one of the best! Would like to integrate Daily reporting into this, also would like a toggle to allow pushing all items to master. This is a great tool to help ANY contractor. this industry is going paperless whether your ready or not. Time is decreasing with efficiency increasing. communication with trades is becoming more streamlined as well! 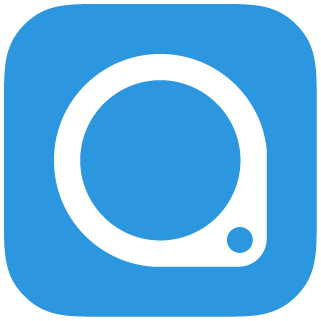 With the constantly changing construction industry, this app makes it easy to keep up. I'm not sure how anyone ever managed without it before. Then again, project drawing changes are more prevalent than ever. This app is a must for ANY GC, CM, or even sub-contractor for large scale project. It's even helpful on the side small scale ones too. It makes As-Builts easy for the field foreman, many times this was a chore before. Now they can make these notes on the project during whatever they're working on without having to go back to a trailer or office. There is nothing I dislike about this app. However, my least favorite integrated feature are the RFIs. I think they need to make more available options to personalize them to your company. Maybe head the RFI with a company name and logo. This is especially useful for sub-contractors since they have to submit RFI's to a General Contractor who is also getting many RFIs from other contractors. The least you should do is try the trial out on a small project. There's nothing you can lose and I can guarantee you will realize this is something you've needed on your projects once you begin using it. It helps keep up with the constant drawing changes of today's industry. It also reduces in-field mistakes of using outdated drawings. It also improves communication between the field and office. "Excellent time saver, in the field and in document and report production"
The ability to document and report from a single platform, available through the cloud anywhere and in the various devices we use; tablet, laptop, desktop, phone. Being able to access from multiple OSs enables our users to use their device of preference - Android, IOs, Mac, Windows, etc. It lacks direct interaction or integration with other products it teams well with. Not an issue by any means, but a bit of additional integration can result in increased time savings, particularly in the production stage. 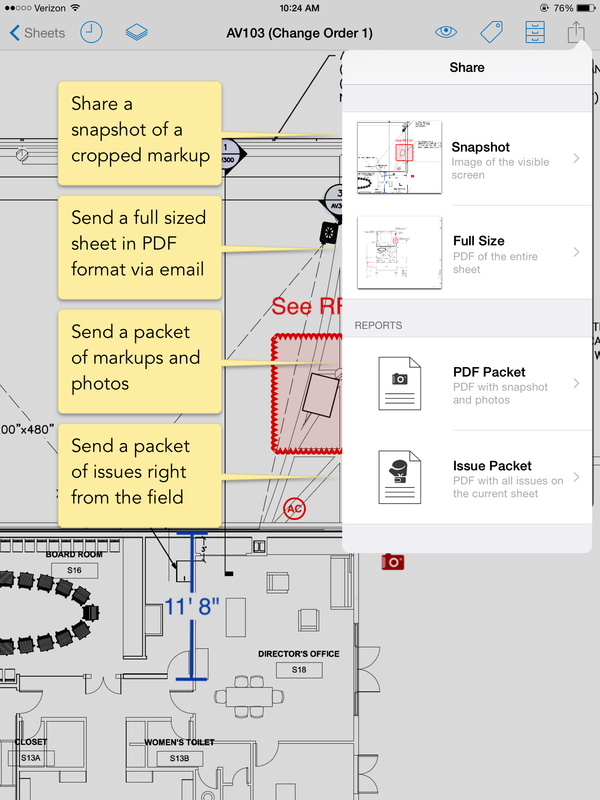 Slow speed when syncing between devices can be an issue if a project has a large volume of sheets, particularly with slow data connections on a jobsite. The learning curve is relatively mild. The pricing model is great as it enables a company to gauge the need based on capacity (quantity of sheets). Particularly well suited for field work, documentation, issue tracking, and punch list follow up. Communication within teams and other trades. The ability to use the same documents and maintain a change log is a great benefit that keeps all in sync. "Great software for field side"
The office side is lacking right now. The RFI and Submittal process is very basic and generally doesn't cover my needs. I always find myself uploading my PDF RFIs and Submittals and then linking the documents rather than using the built in tools. PlanGrid has definitely increased the speed and ease with getting information from the office to guys in the field but without adding the necessary feature to be a single source of document creation and viewing it will never be a stand alone product. Some of these issues could be solved by incorporating other software (i.e. BlueBeam) but for now it is great in the field, not so much as a one stop shop for the office. "Best tool in the tool kit." The ability to have my current plans and specs with me at every meeting on my iPad. Quick rendering when viewing sheets, can work offline and sync later. Punch list reports are very quick and easy to prepare, saves lots of time, easy to track and update. The only thing I can think of, is that it takes a little time to learn how to use the tool to meet your work flow, or customize your work flow to incorporate the tool. Simple things like how to name and upload plan sets and keep old versions, once you develop a good process this is not an issue. It is worth every penny, just try it you will not be disappointed. Trying not keep a paper set of plans current, not carting around a massive set of floor plans to take notes on in the field and an easy way to develop a field observation report/punch list and easily and quickly distribute to team. There are 2 features that I really like. The first is PlanGrid's ability to pull in my drawings from pdf files and then allow me to very quickly pan and zoom them in the field on my iPad. 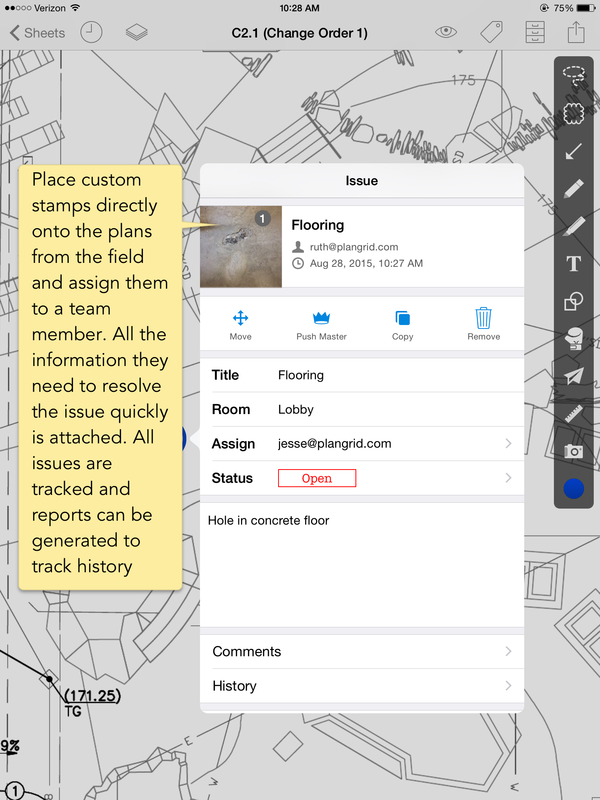 The second is the Issues feature which allows me to keep up with issues throughout the course of construction and then easily create either Field Reports or Punch List Reports based on what I witnessed in the field. There is really not much to dislike about PlanGrid. The cost is a little high (it seems) if, within the same organization, there are several employees that need access to PlanGrid. Give it a try for free. Choose up to 50 sheets to upload. All of the features are available in the free version. The biggest benefit is to immediately issue to the contractor a Field Report or Punch List Report before leaving the job site. In the past, I would have to come back to the office and sit down in front of my computer and write up a report based on the numerous field notes that I made. Now, with PlanGrid, it is almost instantaneous. "Want to really focus on the actual building and not the project files? " I like carrying around 200 pounds of current contract documents in my 1.5 pound iPad. I can find anything I want in just a few seconds and not have to be connected to the internet. Field discussions can be more productive because I have all the information to reference. Nothing really. Would like to switch back and forth from the plans to the previous attachments quicker. I am consulting Resident Engineer (Construction Manager) on Public Agency jobs. Most of my projects are Design, Bid, Build (Low Bid), so that means there is a lot of asking the question - How does the Contractor get paid performing the work they are doing? How they are getting paid are in the Standard Specifications or Special Provisions. It's nice for our Inspectors to have this information with them so they can review this info with the contractor prior to performing work so everybody is on the same page. Now that all of our Inspectors have access to PlanGrid, they can stay in the field all day and can observe/inspect all the work taking place, which really is a win for the project as a whole. The issues feature, which most in the construction field know as a punch list, is bar none the easiest and most user friendly punch list generator on the market. It is super easy to use and produces a report at the end of the process that is professional looking including pictures of all of the issues. It has totally eliminated the "what does this comment mean?" questions. The mark-up feature is very easy to use. This is especially important when collaborating with teams that are not in the same geographical region. No more copying the plan area, marking it up, scanning and emailing, now it can be done in real time while on the phone. Since PlanGrid is still developing the only way to handle submittals for a project is with "workarounds". It can be done but requires a little more work than some of the other products on the market. It is really hard to complain about this piece of software, overall it is really easy to use and their customer service is top rung. Give the free trial a shot. Use it on a small project and see if it works for you. The Isuues Feature has mad doing punch lists very fast and very thorough. This reduces time and get the information into the contractor and owner's hands in a more timely manner. We work with project teams that are spread out throughout the country and this product makes it very easy to collaborate across time zones. "Fast, Easy to Learn, Collaborative"
The system is extremely fast on an iPad in comparison to opening and moving around a pdf in adobe or bluebeam. It is very easy to make edits, upload ASI's and PR's as well as make annotations for trades to view. I like being able to make links to important documents like RFI's. All these features ensure that our subs are working off the freshest set of drawings with the newest changes. The change log is great for me to view what changes I have made. I would like to see the web view have a full screen view of the drawings. On my 27" monitor it takes up a small space. I would also like to see some of the features like sorting drawings by tag incorporated into the web view as well. Plangrid is doing a great job adding to features. I would advise that if there is something that is missing that you need you should contact them. They are very responsive about fixing problems and adding features. The biggest benefit that I have realized is pushing up to date drawings into the field. The cost of a plan grid subscription is less than that of continued printing of new drawings sheets or replacing sheets that have been destroyed in the field. It's still very new to a lot of field people so it's sometimes hard to get them to understand it and use it. This an easy and very trainable product. I believe that this is where the industry is heading and more thing will be on tablets. It helps with communication from office to field. The biggest problem it is solving is making sure that everyone has the most to date drawings for every project. It saves a lot of time not having to print and bring out to the site all the time. Also, the size of an iPad/tablet is a lot more convenient than large size drawings. The best part about plangrid is you don't have to lug around drawings and a submittal book all the time. Everything is stored and organized on your phone or tablet. I wish there was a notepad in the application so i can make notes while at meetings. Also I wish plangrid had an account in between Nailgun and Dozer that would save our company a lot of money. We almost always use over 550 sheets but almost never go over 1500 or 2000 sheets. It is a lot faster getting the new bulletin drawings to the foreman in the field. If we make a change or mark up drawings the guys in the field have direct access to it. It saves us a lot of time and money. "A must have app for project management!" I pull this program up on any device, from the office to my phone in the field. I love this app, it has all of the tools I need to easily pull up the plans on a job site. Very simple to make notes, send out RFIs, take pictures and use them as reference and share items with other users. I like that you can download the plans to your device so that you do not always have to depend on a good internet connection. My only issue with this is the recently updated price point. I feel like where they were at before was fair, but now the pricing is high, especially if you are paying for several users. Previously, when my foreman in the field had an issue with the plans or something in the field did not match what was on the plans, I would have to run out to a job site to clearly communicate what's going on. Now, my foreman can make notes on the plans, add pictures and push it immediately for me to view. Saves a lot of travel time and I can spend more time getting new work, not driving to existing jobs. Also, my billing is accurate and up to date since my foreman takes pictures of the progress in the field. Access to multiple projects on one platform. Apps have to be A-framed into the program. It fits well with managers handling multiple projects as well as field personnel who need to file reports and send RFI's for quick turn arounds. Negates the need to carry around plans for every project. It's great being able to have the most current drawings on me no matter where I am or what device I'm carrying. It's also really great to quickly be able to pull up the drawing you need out of the hundreds there may be on any given project. Keeping construction drawings current at all times very quickly with very little effort. I have been using PlanGrid for over a year now and can't remember what I did without it. It make going to a job site so much easier. I am not carrying paper drawings abounds anymore yet I have so much more information with me when I am in sites. I upload attachments (bldg stnds, spec books, meeting minutes, cut sheets etc) and have all that information. I started out with just doing punch list and I can't tell you how much time it has saved. Now I am using it right from the start. I like the feature of laying plans on top of each other to see the changes. Works great for reviewing space plans. The only think I wish it would have is a place to take meeting notes. I can take notes in another app and then bring over to PlanGrid. But skipping a step would be great. I am always telling people about PlanGrid. I am a fan. Makes it very easy to sync notes from field and office engineers and communicate with clients. Especially appreciate ability to directly link pictures and draw on plans. GREAT for punchlist! Wish there were more shortcuts for tasks I repeat a lot. Great for field use and keeping track of site plans! You can put multiple people on one account as collaborators (? ), you don't have to buy a membership for each person. Mid-level price option is probably plenty for your needs. Very user friendly, quick learning curve.